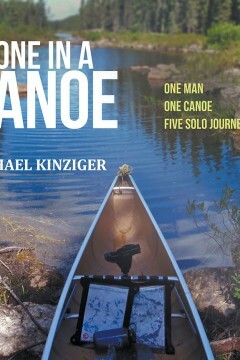 One man, one canoe, five solo journeys to five remote wilderness regions in Western Ontario, Canada. Can you imagine being retired (over 60), healthy and determined to research and travel alone for three weeks or longer on numerous wilderness trips into areas that you know little about? Can you imagine not being in verbal or social media contact with anyone for over one hundred days of travel? What does it take to be self sustained and responsible for all of one’s actions and decisions? The solo canoe journal stories are a combination of the day to day excursions and decisions that a solo paddler must make to successfully navigate from one lake or campsite to another and to another and so on while managing to stay safe and to not get lost in the wilderness. The journal stories are also filled with very real and personal insights into the mind frame of the author who attempts to relate to the reader the intense feeling of what wilderness, or solitude or fear or a number of intimate emotions means to him in the moment. Alone in a Canoe also includes detailed gear and food lists and trip statistics. The stories are inspiring. It is a must read if you ever dreamed about what it would be like to be alone in a canoe in the wilderness for any length of time. The book is printed in a 8 ½ by 8 ½ format to enhance the more than 200 color photos documenting the journeys. People who Paddle a Canoe, Outdoor and Wilderness Enthusiasts, Backcountry Educators, Adventure Advocates, Future Campers, Fisherman, Recreators, Dreamers, Individuals who Cherish Solitude, and Folks who enjoy great Nature Photography will enjoy this book.